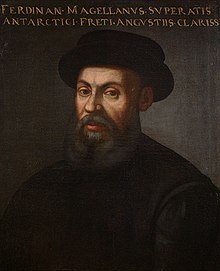 Ferdinand Magellan (Spring 1480 – 27 April 1521) Portuguese sea explorer who sailed for both Portugal and Spain; the first person to lead an expedition to circumnavigate the earth; born Fernão de Magalhães he changed his name to Fernando or Hernando de Magallanes after entering into the service of Spain. The Church says that the Earth is flat, but I know that it is round. For I have seen the shadow of the earth on the moon and I have more faith in the Shadow than in the Church. It is a blessed thing that in every age some one has had individuality enough and courage enough to stand by his own convictions, — some one who had the grandeur to say his say. I believe it was Magellan who said, "The church says the earth is flat; but I have seen its shadow on the moon, and I have more confidence even in a shadow than in the church." On the prow of his ship were disobedience, defiance, scorn, and success. But though the church hath evermore from Holy Writ affirmed that the earth should be a wide-spread plain bordered by the waters, yet he [Magellan] comforted himself when he considered that in the eclipses of the moon the shadow cast of the earth is round. Variant: The Church says that the Earth is Flat, but I know that it is Round. For I have seen its Shadow on the Moon and I have more Faith in a Shadow than in the Church. They tell your kids they gotta love Justin Bieber, and then...your children are turned into a mindless vassals—who now, they look up to some twit, instead of looking up to Thomas Jefferson, or looking up to Nikola Tesla, or looking up to Magellan; I mean, kids, Magellan is a lot cooler than Justin Bieber! He circumnavigated with one ship the entire planet! He was killed by wild natives before they got back to Portugal! And when they got back there was only like eleven people alive of the two hundred and something crew and the entire ship was rotting down to the waterline! That's destiny! That's will! That's striving! That's being a trailblazer and explore! Going into space! Mathematics! Quantum mechanics! The secrets of the universe! It's all there! Life is fiery with its beauty! Its incredible detail! Tuning into it! They wanna shutter your mind, TALKING ABOUT JUSTIN BIEBER!!! IT'S PURE EVIL!!! They're taking your intellect, your soul, and giving you Michael Jordan and Bieber. Unlock your human potential! Defeat the globalists who wanna shatter your mind!—Your doorways to perception!—I wanna see you truly live! I wanna see you truly be who you are!!! Alex Jones, The "Justin Bieber" Rant (February 21, 2011). So many of them charged down upon us that they shot the captain through the right leg with a poisoned arrow. On that account, he ordered us to retire slowly, but the men took to flight, except six or eight of us who remained with the captain. The natives shot only at our legs, for the latter were bare; and so many were the spears and stones that they hurled at us, that we could offer no resistance. The mortars in the boats could not aid us as they were too far away. So we continued to retire for more than a good crossbow flight from the shore always fighting up to our knees in the water. The natives continued to pursue us, and picking up the same spear four or six times, hurled it at us again and again. Recognizing the captain, so many turned upon him that they knocked his helmet off his head twice, but he always stood firmly like a good knight, together with some others. Thus did we fight for more than one hour, refusing to retire farther. An Indian hurled a bamboo spear into the captain's face, but the latter immediately killed him with his lance, which he left in the Indian's body. Then, trying to lay hand on sword, he could draw it out but halfway, because he had been wounded in the arm with a bamboo spear. When the natives saw that, they all hurled themselves upon him. One of them wounded him on the left leg with a large cutlass, which resembles a scimitar, only being larger. That caused the captain to fall face downward, when immediately they rushed upon him with iron and bamboo spears and with their cutlasses, until they killed our mirror, our light, our comfort, and our true guide. When they wounded him, he turned back many times to see whether we were all in the boats. Thereupon, beholding him dead, we, wounded, retreated, as best we could, to the boats, which were already pulling off. Antonio Pigafetta's account of Magellan's death at the w:Battle of Mactan, w:Philippines. Most versed in nautical charts, he knew better than any other the true art of navigation, of which it is certain proof that he by his genius, and his intrepidity, without anyone having given him the example, how to attempt the circuit of the globe which he had almost completed... The glory of Magellan will survive him. This page was last edited on 9 March 2019, at 18:34.